Welcome to Hanamoora Plays! This is where I ramble about games that I play, and is typically not intended as a review. Instead, it's basically me just documenting experiences. So! With that out of the way, I'm going to begin with a (free!) fan-developed Puyo Puyo title that I've gotten my friends into: Puyo VS! With Puyo Puyo Tetris out and ready to import, I am excited for that. I decided to take my excitement and play a Puyo game I know full well I can. As you can see, people are capable of getting 15 chains and in that event, one false move and you're done. I generally get good combos in Endless Fever mode, but that's about the only mode I do decently in... and even then. Sling me into a regular game and you've got a 90% chance of winning. If you stick me in a Fever match it will all depend on how well I'm able to calculate the best times to throw out combos to get rid of the nuisance Puyos and add to the Fever bar. I literally don't even know how this happened. I was playing against a CPU and he sort of just let the Puyos build up to the top. Maybe he felt sorry for me or something. I don't know what your plan was, Satan, (yes his name is literally Satan) but I somehow won. Hooray! The game is a bit of a pain to set up, but once done, it's pretty fun to play with friends or anyone from across the globe. WORD OF ADVICE: If their name has the tag _jp at the end, don't even. I learned that the hard way. There are some times when I can do things right, at least. And well... 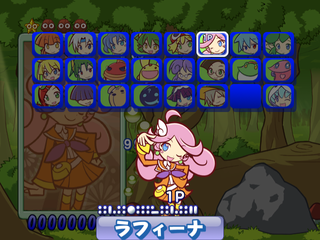 I think that part of the fun in playing Puyo VS isn't with those you don't know. The fun, to me, comes from playing with up to 10 people you actually know over the internet. I've had some crazy matches with my 7 other friends. No one is safe. No one. And well, that's my Puyo VS story.